Carrie Singleton is just about done with Clover Ridge, Connecticut until she's offered a job as the head of programs and events at the spooky local library, complete with its own librarian ghost. Her first major event is a program presented by a retired homicide detective, Al Buckley, who claims he knows who murdered Laura Foster, a much-loved part-time library aide who was bludgeoned to death fifteen years earlier. As he invites members of the audience to share stories about Laura, he suddenly keels over and dies. The medical examiner reveals that poison is what did him in and Carrie feels responsible for having surged forward with the program despite pushback from her director. Driven by guilt, Carrie's determined to discover who murdered the detective, convinced it's the same man who killed Laura all those years ago. Luckily for Carrie, she has a friendly, knowledgeable ghost by her side. But as she questions the shadows surrounding Laura's case, disturbing secrets come to light and with each step Carrie takes, she gets closer to ending up like Al. 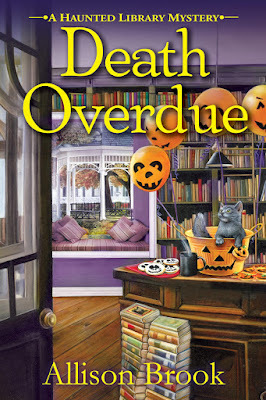 Now it's due or die for Carrie in Death Overdue, the delightful first in a new cozy series by Allison Brook. Good morning Carrie. Thank you so much for agreeing to speak with me today. My pleasure. Thank you for having me as your guest. You’re welcome. Before we get started, can you please tell me a little about yourself? Certainly. I’m about to turn thirty. Yikes, am I really that old? I grew up on Long Island, but for years my brother and I spent our summers on our father’s family’s farm just outside of Clover Ridge, CT, where I now live and work. I didn’t have a happy childhood. I’d say my family was dysfunctional. Which may be the reason I lived in seven different places after graduating from college. But I’m a different person now. I’m the Head of Programs and Events of the Clover Ridge Public Library. I love my job, planning classes and programs for the patrons to enjoy. How long have you worked at the library? For the first seven months, I worked in the library wherever I was needed—helping out in the children’s section, reshelving books and tapes when things got hectic with returns, helping patrons at the hospitality desk. I’ve been at my present position for a month, though it seems much longer. Congratulations on being named Head of Programs and Events. I heard about the tragic death of Al Buckley. I know that you decided to do your own investigation. Why? Detective Al Buckley’s death hit me very hard. His program had been set up by the woman who held my job before me. Al was going to talk about a homicide that he hadn’t solved fifteen years earlier. He claimed he now knew who had murdered Laura Foster, a well-liked Clover Ridge resident who also worked in the library. My boss Sally thought the subject was too controversial and wanted me to cancel the program, but I convinced her otherwise. Al was such a nice man! I was horrified and guilt-stricken to see him die before my eyes. I blamed myself. Al was dead because of me. I should have listened to Sally. The best way to make it up to him was to find his murderer. Laura’s younger son and I set out to find the person who had murdered his mother and Al Buckley. I’m told your library is a little haunted. Can you tell me about the librarian ghost and how she exactly helped with your investigation? I met Evelyn Havers the morning Sally called me in to offer me the position of Head of Programs and Events. I was all set to refuse the position and leave Clover Ridge when a voice advised me, in rather strong terms, not be be a fool. I should at least tell Sally I’d think about it. I was shocked to realize a ghost had spoken to me. I’d never met one before. When Evelyn was alive, she’d worked as an aide in the library. Though she gave me some good advice on library matters and background about Laura Foster, the truth is, she wasn’t always helpful regarding my investigation. For one thing, she knew that her spiteful niece, who also worked in the library, was doing mean things to me. She was worried that Dorothy might be the killer. Wow. What’s it like to work with a ghost? Very difficult. Evelyn is a lovely woman, but she’s the Queen of Evasiveness. I never know when she’ll appear, and when she decides to show up, it’s always in a different outfit. If I should ask her where she keeps her clothes, she changes the subject. It’s difficult talking to her because I’m usually surrounded by people. I don’t want anyone overhearing our conversations. People would think I’m speaking to myself and start to worry about me. Did you believe in ghosts before this? I’m sure you’ve seen the cover for your book, Death Overdue. I love it by the way. There’s a little gray cat in a bowl. Who’s the cat? That’s Smoky Joe. What happened was one day I heard him meowing near my cottage just as I was ready to go to work. For some reason he jumped into my car then, when I got to the library parking lot, he jumped out. I was terrified he was going to get hit by a car. Before I knew it, he came into the library. And here I was, in a brand new job, bringing a stray cat into the library! He ran right to the children’s section. The little ones made a big fuss about him. Then would you know it, Sally appeared with Marion, the children’s librarian. When she asked what this was about, I said I’d brought in our new library cat. Sally didn’t get a chance to say one negative word because Marion was loving the idea and the kids were thrilled. Smoky Joe proved to be a people cat, so she agreed. And now Smoky Joe comes to the library with me every day. I love that story! Tell me about your creator, Allison Brook. What is she like? I love hearing about murder mysteries and romance. Carrie, I’m very glad you survived the events of Death Overdue. I’m looking forward to your next adventure. Thank you. You’ll meet my father, who—believe me—is NOT your typical father. He’s after a bag of gems worth millions of dollars that doesn’t even belong to him. Soon people are getting killed and more people are searching for those gems. But we’ll save that for next time. You have definitely piqued my interest. Thank you again. 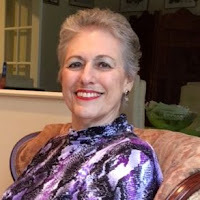 Allison Brook is the pseudonym for Marilyn Levinson, who writes mysteries, romantic suspense and novels for kids. She lives on Long Island and enjoys traveling, reading, watching foreign films, doing Sudoku and dining out. She especially loves to visit with her grandchildren on FaceTime. You can follow the Death Overdue Blog Tour here. Fun character interview, my interest is piqued too! Thanks Julia. I'm glad you liked it. Thank you for having us today. Carrie loved being interviewed by you! Hi Marilyn. Thank you and Carrie soooo much for the interview. Thanks for stopping by. A haunted library, a cat and a ghost! That has to make for a great read. Adding to my TBR list. This book is on my reading list too. I hope you get a chance to read and enjoy it. And don't forget the murders.